In November, 2015, Smith was a childcare worker in Queensland. 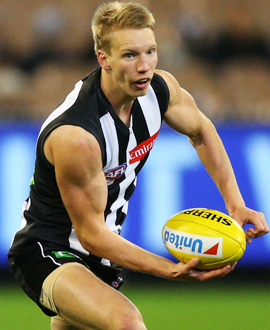 Less than eleven months on, he was a contender for Collingwood’s Copeland Trophy. Few players have been on a journey such as Smith’s, who, at 21, was a mature-aged recruit and had to make every post a winner. He didn’t let anyone down, debuting on ANZAC Day and holding his place for the remainder of the season. At his best, he was winning 35 disposals and kicking goals from half back, as he did against the Suns in the penultimate round.